Installing a full-functioning outdoor kitchen is a great way to entertain outside without making numerous trips in and out of the house. Grills, range hoods, sinks, refrigerators and other cooking appliances can be easily incorporated outdoors and serve a purpose year-round. You’ll be able to enjoy your guests while preparing meals and fixing drinks all at the same time. Stacking compactly to the side of the opening, folding glass doors use a smooth track system, creating a seamless transition between your indoor and outdoor living spaces. 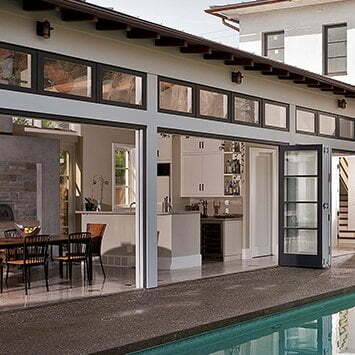 Folding doors also help maximize the natural light coming into your home, whether they’re open or closed. Installing an outdoor television on your patio doesn’t mean just bringing an indoor TV outside. By being sealed from moisture and resisting the glare of the sun, outdoor TVs are built to withstand the elements and have better performance than other TVs. So, make sure you choose a television that is specifically designed for outdoor use. A water feature can set a more relaxed atmosphere with its soothing sounds and attraction of wildlife. It can also act as a charming focal point of your backyard and enhance your outdoor living space. Including a fire table will make your patio much more comfortable, whether you’re relaxing on your own or entertaining guests. If you often have parties going late into the night, a source of heat will allow guests to continue enjoying the event without getting too cold in the winter. The best part about fire tables is they blend in with the rest of the patio furniture while creating a cozier, more communal feel. Ceiling fans are a great way to create a breeze on your patio. By choosing an energy-efficient model, you’ll stay cool during the summer without racking up the energy bill. 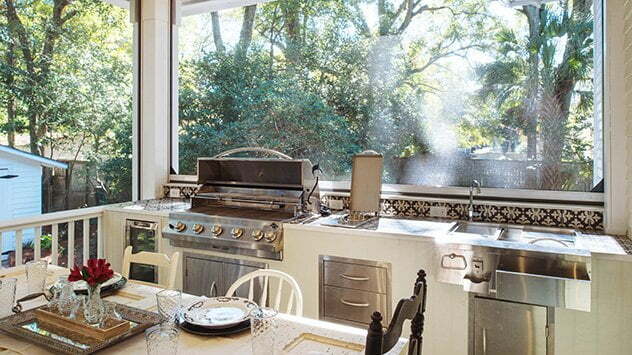 With an outdoor kitchen, the uses of an overhead fan increase as it can circulate the air so steam from the grill doesn’t settle in the sitting area. 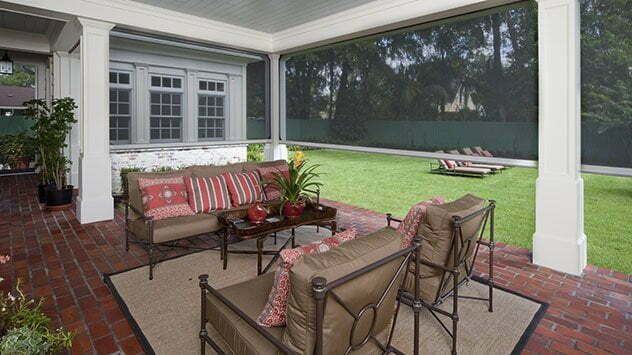 Motorized screens, such as ones from Phantom Screens, are the perfect solution for bringing the outdoors in. The retractable screens appear at the touch of a button and disappear when you don’t need them. Custom made and professionally installed, they provide fresh air, shade from the sun, climate control, protection from insects, as well as a bit of privacy while sitting on the patio. Loved the articles on outdoor living. I really enjoy your newsletters online, and the tv shows on Sun morning. Thanks for all that you do. I live in Theodore Alabama and would like to be considered for a project show. Not sure what type of things you are looking for, but we are open to almost anything. We live on Rabbit Creek, have a large back yard and our house is 10 years old so I’m sure you could tell us ways to improve. Thanks for all your help over the years!